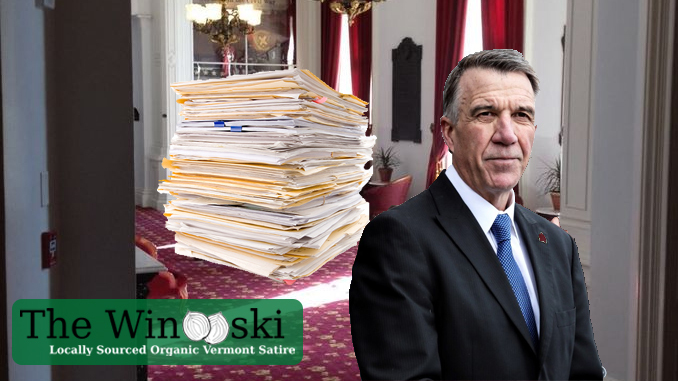 MONTPELIER – Vermont Governor Phil Scott passed the state budget sitting on his desk yesterday, glanced over at it, made what witnesses are calling an “angry face,” and kept right on walking, refusing to even make eye contact with what once was considered a close ally. Sources inside the statehouse have reported that Gov. Scott has passed the budget in the halls many times over the past few weeks, but refuses to speak to it, or even acknowledge it at all. Despite pressure from friends and political allies, Gov. Scott will not allow any contact with the budget, even going so far as to threaten it physically and warn it to stay away from him.